Irma is expected to reach south Florida by Saturday evening into early Sunday morning. Irma is hugely dangerous, much of Florida potentially affected, especially southern areas. The National Weather Service (NWS) warned of life-threatening hazards, notably from storm surge and large waves generated by heavy winds. “Storm surge can reach heights well over 20 feet and can span hundreds of miles of coastline,” warned the NHC. Irma is a hugely dangerous Category 5 storm, its sustained heavy winds (now around 175 MPH, gusting to 200 MPH) the strongest ever recorded in the Atlantic basin. It devastated Barbuda, St. Barthelemy, St. Martin, Anguilla and the Virgin Islands with 185-mile winds. It was the strongest ever hurricane to strike the northern Leeward Islands. Over a million Puerto Ricans lost power from the storm, in some areas expected to take months to restore. US states likely affected include Florida, Georgia, North and South Carolina. Storm-track models show Irma’s path striking Florida’s east or west coasts, its core possibly hitting the center of the state and moving north. Its too early to know its precise track for sure. 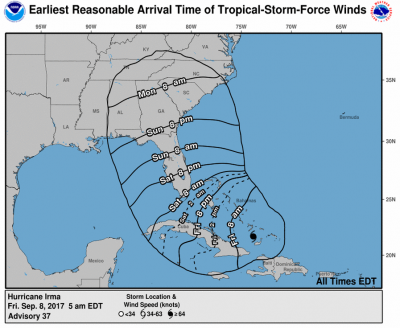 So far, it’s uncertain which track Irma will take to Florida, why extreme caution is vital in all potentially affected areas, including heeding evacuation orders. In some areas, it’s mandatory. Officials warn that Irma could affect the entire state. The NHC issued a hurricane and storm surge watch for southern Florida, residents potentially in its path told to evacuate. As around pre-dawn Friday, Irma was about 500 miles east-southeast of Miami, moving west-northwest at 16 MPH. One model showed it tracking closer to the middle of the state, then swerving east while moving north. But it could change before making landfall. It’ll likely remain a Category 4 or 5 storm for the next two days. Millions in Florida could lose power for days or weeks, affecting homes, businesses and other facilities. Florida Power & Light (FPL) intends shutting its two nuclear power plants in the state. Officials warned rebuilding parts of its system may be necessary, taking weeks to complete. Miami-Dade County Mayor Carlos Gimenez issued an evacuation order affecting over 650,000 people. Earlier, Florida Keys residents were ordered to leave. Before abating, Hurricane Irma may be the most devastating hurricane in US history in damage done to affected areas and possible loss of lives. By early Saturday, its path and strength when making landfall should be known. It’s a killer storm no one in potentially affected areas should take lightly. Featured image is from nhc.noaa.gov.